Himachal Pradesh Congress Committee (HPCC) president Thakur Sukhvinder Singh (Sukhu) has revealed to constitute new state working committee. 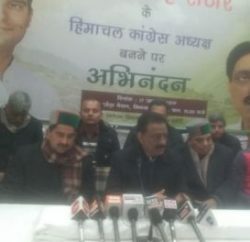 Congress state president, while addressing press at Nurpur said that this new committee will have maximum 31 members and active new faces will be given priority. He said the Congress was gearing up its rank and file in view of the forthcoming parliamentary Election. He added that he was holding district-level meetings across the state in which all party leaders actively taking part. He revealed that he’ll convened workers’ interaction meetings at the parliamentary constituency soon after completion of his state tour. Sukhu is hoping to win all four Lok Sabha seats and attributed Virbhadra Singh led government’s positive approach towards the people grievances will enable party to make clean sweep in the forthcoming general election. 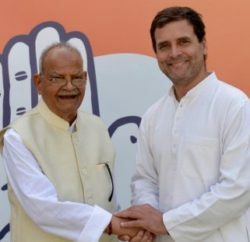 He claimed that Congress candidate will also win convincingly in the Mandi by-poll schedule on 23rd June. He praised the working of Virbhadra Singh government and claimed that it has so far successfully provided relief to the all section of the society. He also claimed to have improved co-ordination between government and party functioning. He cautioned party leaders and workers to desist from anti-party activities and urged them to work to strengthen party at grassroots level. He warned that warring party workers won’t be spared and strong and exemplary action will be taken against them. 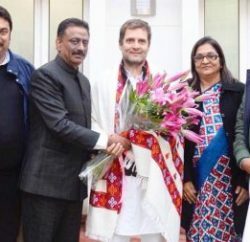 He said that so far HPCC had received 317 complaints of anti-party activities against workers and leaders from official candidates for the last Assembly elections and after assessing the facts from block congress committee, Himachal Congress has expelled 35 workers and issued 84 show-cause notices. Earlier, Congress workers along with local legislator Ajay Mahajan welcomed Sukhu on his arrival at Nurpur.